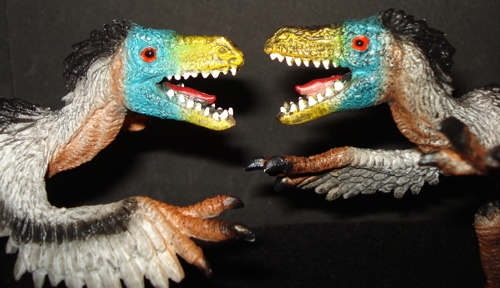 Bullyland Velociraptor: the hooligan of Dinosaur toys. 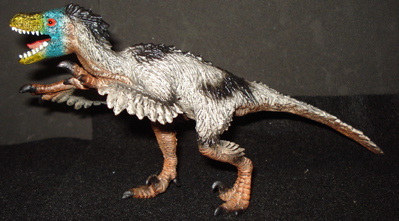 It is hard to believe the amount of controversy caused by this finely feathered fellow. 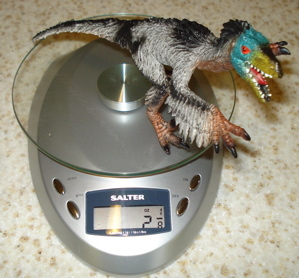 Dinosaur toys collectors everywhere have risen in protest against this two & one-eighth ounce (2.125 oz, 61 gms), nine inch (9", 23 cms) long (officially 1/20 scale) soft rubber member of the Dinosaur toys community. 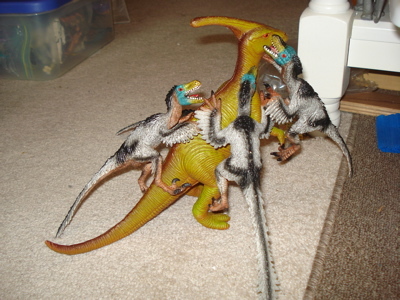 This is a "love-it" or "hate-it" pre-flight Velociraptor simulation. that we have a very well insulated creature underneath the feather-quilt. lighter to darker shades as these figures are individually hand painted. 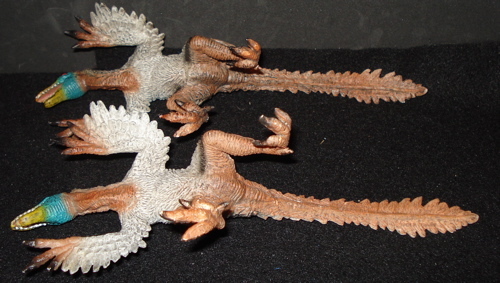 This is another nice aspect to these Dinosaur toys, yours will be an individual. 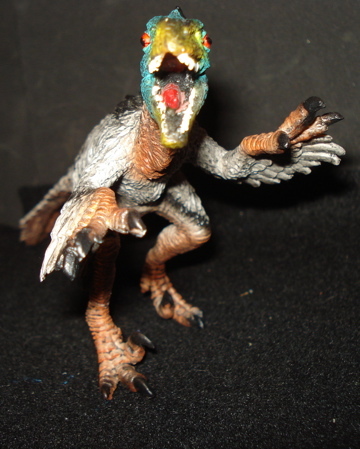 The hand painting extends to the Bullyland Velociraptors mouth where-in the palate is painted in a pale purplish hue, the tongue is a deep red while the floor of the mouth (and the lingual frenulum?) is a dark brown or black. 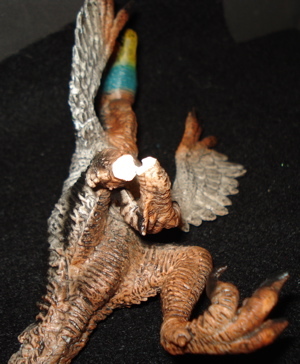 The teeth are individually detailed and painted white. Fourteen teeth in the upper and eighteen in the lower jaw. The underlying rubber is a bright, bone-white and the hand painting is a bit delicate having a tendency to rub off, exposing the white underneath. 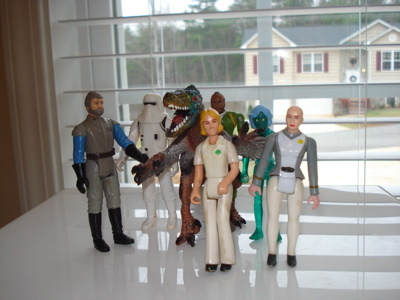 Dinosaur toys figure. The soft rubber makes it quite different from the many harder-rubber figures out there, both from Bullyland and many other companies. 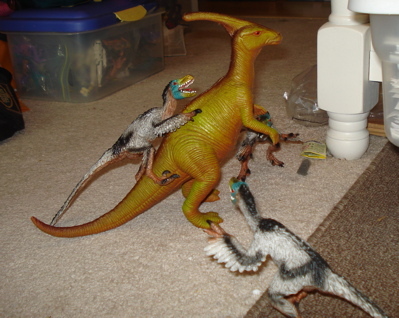 The malleable legs allow it to (relatively) easily jump onto and hold on to its prey. Here (below) we see them in action. "Stop, stop cut...cut... one of our stars is injured....."
This is a tragic turn of events folks and it looks as if we will have to cut our page short to take care of this emergency.... The break appears to be a clean one but the entire foot is held on by only a small sliver of "skin"! Oh, the humanity, the humanity. things all right. In this case it can be "easily" healed. 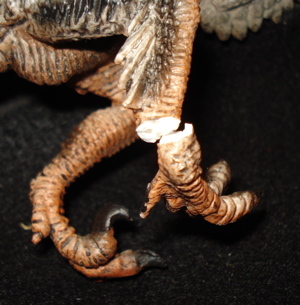 Because of the soft rubber the Bullyland Velociraptor is made of we can push a pin up through the heel. It will act as support, like rebar, holding the broken foot onto the leg. A second pin will create a strong structure so it will not easily twist out of line. "His repaired 'bionic' leg will be stronger, faster...."
As can be seen, here in the post-surgery, the pins have been placed in our still unconscious Bullyland Velociraptor's "heel" and are creating a good bond. Due to the clean break there is virtually no evidence of the damage to be seen. "I'm sure glad they didn't eat me...."
Yes, being mended is a lot better than being a meal. 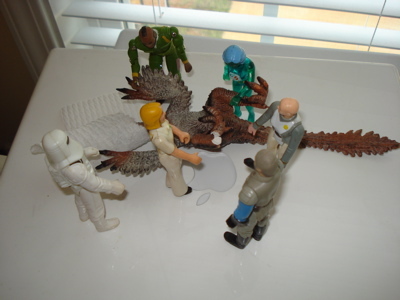 Actually that Bullyland Velociraptor wasn't hurt while we were doing the page. And no, we don't use stunt doubles either. 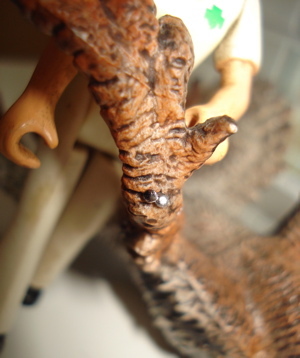 The reality is that I found him in my Velociraptor box with the ankle broken for no apparent reason. I have no idea. I had two others that have been roughly carried in my car ready to leap out for interesting photo-ops (although Rexford seems to have that venue locked up) and they are fine. A little wear on their paint jobs but no damage despite over a year of regularly rough handling. Not to mention the temperature range from high Summer in the Southeastern USA to subfreezing winter days, all while laying in a box with tools and various other odds & ends I drive around with. One of the things that I really like about these is the soft rubber that they are made out of and which proved to be the salvation for the broken ankle. 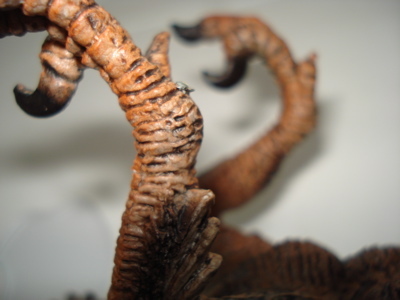 Ordinarily the hard rubber that Dinosaurs toys are made of is very resistant to repair, glues usually being worthless. A similar injury could require a "hot" pin to make the repair which is both dangerous and a sloppier repair. 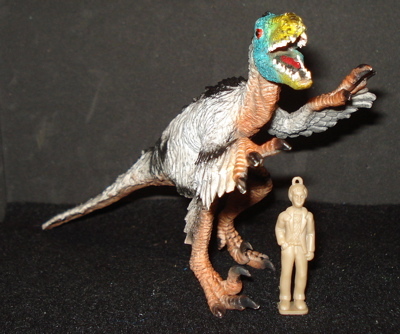 This figure came out in 2008 and remains in production, being part of Bullyland's Museum Line and is available on the "web" for $11.99. I did a search and that's the only price I have seen. These are made in Germany (NOT China) by Bullyland and are made using a proprietary process so Bullyland guarantees that there are neither pthalates nor any PVC in their product. I still wouldn't eat one although they did seem willing to eat each other. 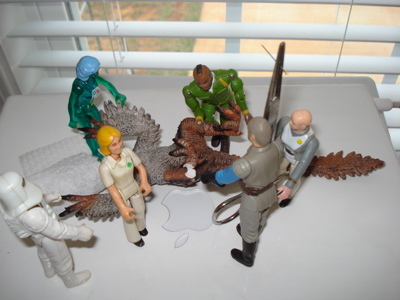 Despite the anomalous broken leg I still really like these figures. 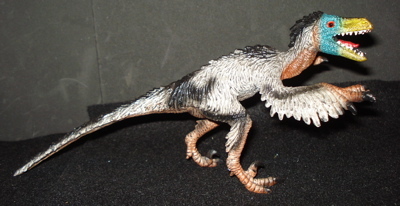 Yes, the Bullyland Velociraptor is a little 'brutish' in appearance and the stance is a bit melodramatic. But the play value of the soft rubber is extremely high (witness the abortive attack on the Parasaurolophus earlier) and these really don't damage easily at all. 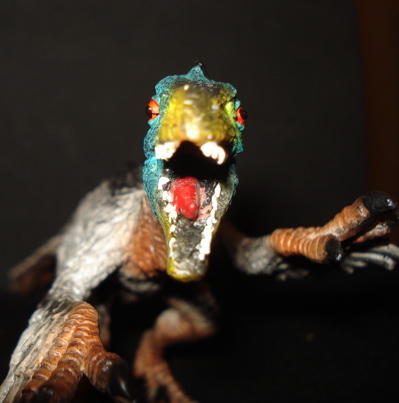 We hope that you enjoyed our adventure with the Bullyland Velociraptor and perhaps got some insight on the dangerous work we are engaged in to bring you our site. 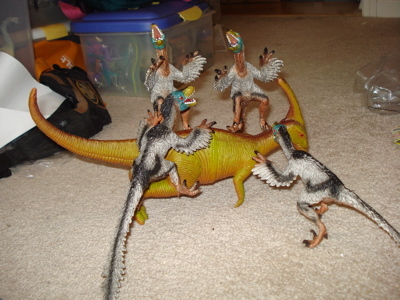 By clicking here you will return to the Velociraptor main page.